Patrick Kapust serves as deputy director of OSHA’s Directorate of Enforcement Programs, and leads a staff supporting OSHA’s mission of standards enforcement. He started with the agency in 1991 as a compliance safety and health officer. In October, Kapust spoke with Safety+Health Senior Associate Editor Kyle W. Morrison about recent changes OSHA has undertaken regarding its enforcement efforts. S+H: The current administration has increased its use of press releases to publicize fines and penalties levied on employers, even when assessed penalties are as low as $7,000. Top OSHA officials – including David Michaels and Jordan Barab – have said these releases help incentivize other employers to abate hazards. Is OSHA seeing increased awareness of workplace hazards as a result? Patrick Kapust: OSHA generally issues press releases for larger enforcement cases. But we also have another kind of criteria – our “novel” enforcement cases. These are the cases where we anticipate media attention, or that we want to make other employers aware of. In addition to traditional methods such as press releases, OSHA is using new online social media to communicate our message about worker safety and health. I think we are seeing encouraging results – more hits on our webpages (more than 200 million visits last year alone) and downloads of applications we’ve developed and more requests for information from our field offices. 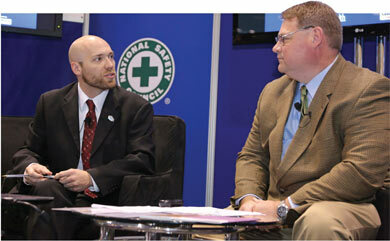 Senior Associate Editor Kyle W. Morrison (left) and OSHA's Patrick Kapust announce OSHA's Top 10 most cited violations at the 2012 NSC Congress & Expo in Orlando, FL. S+H: So this publicity is not merely to shame employers that were cited, but to offer a lesson that other employers may not necessarily be aware of? Kapust: Our emphasis is for employers to correct hazards. Because OSHA can only reach a small number of workplaces in the country every year, the information contained in press releases serves an important educational and deterrent purpose for other companies in the same industry and geographical area. They also serve to bring attention to important novel enforcement cases. Some enforcement actions may not carry large penalties, but may be a case that the public should know about. For example, a workplace violence General Duty Clause case would be a novel case, and that could be a $7,000 or even lower violation because it’s just one single violation. S+H: Two-and-a-half years ago, OSHA implemented its Severe Violator Enforcement Program to replace the Enhanced Enforcement Program. What effect has this change had on compliance? Kapust: The Severe Violator Enforcement Program encourages employers to comply with our standards and abate various hazards. Employers cited with multiple high-gravity willful or repeat violations, or failure-to-abate notices related to the high-emphasis hazards, would be brought into the program. Once employers are placed in SVEP, we do follow-up inspections and conduct inspections at other locations when we have reasonable grounds to believe non-compliance may be systematic. As of Sept. 30, we’ve had 209 SVEP cases. S+H: How does this program compare to its predecessor? Kapust: We are undergoing a study of SVEP to evaluate the program’s implementation – such as the number of referrals and follow-up visits. The program that preceded this was criticized by the Office of Inspector General for, among other items, failing to conduct follow-up visits where possible. We’re also looking at how SVEP affects companies with fixed sites compared with construction companies that are not going to be staying at the same site and may be difficult to follow up on. S+H: Are you seeing some movement out of the program, or improvements from those employers in the program? Kapust: An employer is not eligible to be removed from the program until after three years. Right now, we’re only two-and-a-half years into the program, so no one is eligible to be removed yet. I think the program is having an impact. Given the three years employers have to remain in SVEP during which they cannot have any violations of the same sort that put them into the program, we’re hoping employers will not only comply with OSHA standards, but also start implementing other enhancements, such as third-party safety and health consultation at their workplaces. S+H: Along with increased issuance of press releases on penalties and fines, OSHA seems to be pursuing more corporatewide settlement agreements to abate hazards. Does OSHA plan to continue this, and how often does this occur? Kapust: We are going to continue to pursue corporatewide settlement agreements. We feel that it is a highly effective tool for us to ensure companies address hazards that can seriously injure or kill their workers throughout their worksites. Corporatewide settlement agreements require the kind of widespread change within a corporation – beyond simple compliance with OSHA standards – that can go a long way in keeping workers across the country safe and healthy. We currently have about 14 corporatewide settlement agreements, but we are in the process of negotiating others. S+H: What are you finding by using this as a leverage tool? Kapust: A lot of companies are coming to us and wanting to enter a corporatewide settlement agreement where they’ll abate all the hazards throughout their corporation. But there has to be a little bit more than that. Companies already are required to abate their hazards and meet our standards. For a corporatewide settlement agreement, we look at what kind of enhancements they are willing to provide. For example, I was involved in corporatewide settlement agreement where the employer retained a third party to monitor compliance at their worksites to ensure they maintain a safe and healthful workplace. They also agreed to provide us reports on their progress. S+H: Do corporatewide settlement agreements create any legal hurdles? Kapust: When we enter into them federally, they only cover federal OSHA states. We let the State Plan states know that we’ve entered into a corporatewide settlement agreement, and we encourage them to do so, too. If a state decides to enter in the same agreement with that corporation, then they would be able to enforce it as in the State Plan. But it’s still up to the state whether they want to adopt or negotiate the corporatewide settlement agreement with the employer. S+H: Regarding this year’s Top 10 list, OSHA is in transition between two different data systems – the OSHA Information System has replaced its Integrated Management Information System. Tell us about the reasons for this transition. Kapust: OSHA needed to update its systems to replace its aging IMIS system and to have a more robust web-based information management tool that would allow us to have a better ability to manage, track and evaluate data. That is critical to the operations at OSHA, and to help with our long-term planning. Right now, all the federal offices in OSHA have transferred over to OIS, and it will be deployed to State Plan states in the future. S+H: Will there be any impact on employers? Kapust: Employers will be able to access the data the same way they’ll be able to access IMIS data. The combined OIS and IMIS data is available on the Department of Labor and OSHA websites. They’ll be able to access it pretty much in the same fashion they’re able to now.